Dr. Craig Spencer (center, blue suit), New York City's only confirmed Ebola patient, reunited almost one year later with the staff that cared for him at HHC Bellevue Hospital Center. Dr. Spencer entered Bellevue with Ebola on October 23, 2014 and was discharged November 11, 2014. (New York, NY) - Dr. Craig Spencer – who to date is New York City’s only confirmed Ebola patient – returned to HHC Bellevue Hospital Center today to reunite with doctors, nurses and other medical staff one year after he spent 19 days being treated for Ebola Virus Disease. Dr. Spencer greeted and hugged staff who successfully cared for him while he was in isolation in Bellevue’s Infectious Diseases Unit during the height of last year’s Ebola crisis. "I am here today because of the brave and remarkable commitment of so many nurses, doctors and other team members from Bellevue Hospital," Dr. Spencer said. "My gratitude is as profound and intense as the day I left the hospital nearly one year ago, and I will undoubtedly be forever thankful. Although I have healed, many of the communities affected by the unprecedented Ebola epidemic have not. It is imperative that as a global community we do not forget or overlook their suffering and remain committed to helping rebuild these and other communities in the wake of this terrible epidemic." "A whole team of doctors, nurses, lab technologists and support staff all contributed to Dr. Spencer’s recovery," said Dr. Laura Evans, Director of Critical Care, Associate Chief of Medicine at Bellevue and the lead physician on Dr. Spencer’s case. "It’s good to get everyone together a year later to see how well he’s doing and to celebrate with him." Dr. Spencer arrived at HHC Bellevue and was diagnosed with the Ebola virus on October 23, 2014. He was treated by a specially-trained team of experts and intensive care nurses. He left 19 days later, on Nov. 11, 2014, when doctors declared that he was healthy and able to be discharged from the hospital. "Dr. Spencer’s case demonstrates that a large, public, urban hospital and healthcare system can safely and effectively treat an Ebola Virus Disease patient," said William Hicks, Chief Operating Officer at Bellevue Hospital. "At the end of the day, it was excellent preparation and collaboration that led to the successful treatment of New York City's only confirmed Ebola patient." Since July 2014 Bellevue has isolated and evaluated 17 patients under investigation for Ebola, triggering a strict set of practices and procedures including the use of personal protective equipment (PPE) by staff and isolation of patients in a hospital unit that has been specifically equipped to treat patients suspected of having Ebola. Since Dr. Spencer’s departure Bellevue has continued to build on its Ebola experience and expertise, and in July was designated a National Ebola Training and Education Center (NETEC) in partnership with Emory University in Atlanta, GA and Nebraska Medical Center in Omaha, NE. Experts at Bellevue will work to ensure that health care providers throughout the country are prepared to safely identify, isolate, transport and treat patients with Ebola and other potential emerging threats. Bellevue this year was also named a Regional Ebola and Special Pathogens Treatment Center, one of just nine national referral centers for patients with Ebola or other severe, highly infectious diseases. Bellevue has a long history on the front lines of epidemics and emerging public health threats, and has managed an isolation unit for infectious diseases, such as tuberculosis (TB) and malaria, for many years. It also played a critical role in addressing the emerging HIV crisis in the 1980s. Bellevue is a member of the New York City Health and Hospitals Corporation (HHC) and is America's oldest hospital, established in 1736. Affiliated with the NYU School of Medicine, Bellevue is a major referral center for highly complex cases. The 828-bed hospital has more than 4,000 employees and works closely with interdisciplinary staff throughout the hospital. Its emergency room sees more than 125,000 visits every year. Clinical centers of excellence include: Emergency Medicine and Trauma Care; Cardiovascular Services; Designated Regional Perinatal Center and Neonatal Intensive Care Unit (ICU); Comprehensive Children's Psychiatric Emergency Program; and Cancer Services. For more information, visit www.nyc.gov/bellevue or find us on twitter.com/BellevueHosp. 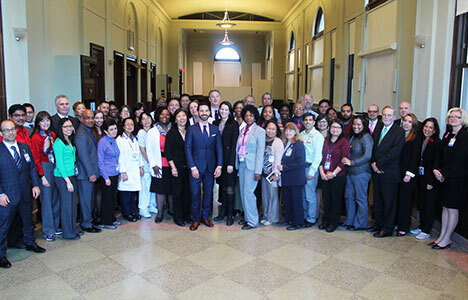 The New York City Health and Hospitals Corporation (HHC) is a $6.7 billion integrated healthcare delivery system, the largest municipal healthcare organization in the country, and one of the New York area's largest providers of government-sponsored health insurance, MetroPlus Health Plan, the plan of choice for nearly half a million New Yorkers. HHC serves 1.4 million New Yorkers every year and more than 475,000 are uninsured. HHC provides medical, mental health and substance abuse services through its 11 acute care hospitals, five skilled nursing facilities, six large diagnostic and treatment centers and more than 70 community based clinics. HHC Health and Home Care also provides in-home services for New Yorkers. HHC was the 2008 recipient of the National Quality Forum and The Joint Commission's John M. Eisenberg Award for Innovation in Patient Safety and Quality. For more information, visit www.nyc.gov/hhc or find us on facebook.com/nycHHC or twitter.com/HHCnyc.